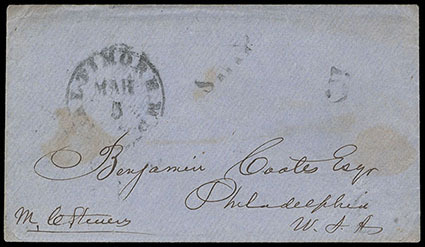 Liberia, "Government House, Monrovia Jan. 23rd 1860", dateline on letter enclosed in gray cover carried by private ship, entered mails with "Baltimore Md. Mar 5" cds and matching "Ship" and "5" rating handstamps to Philadelphia Pa., letter from Stephen A. Benson references Harpers Ferry Insurrection by John Brown and the part played by Frederick Douglas: "I shall regret very much in case Fred. Douglas is arrested for implication in the Harpers Ferry insurrection. Perhaps he will yet find his way to Liberia, & find a resting place at last. ", he says he is going to Cape Mount for several weeks to make peace with the natives and have them remove their barricades, F.-V.F. 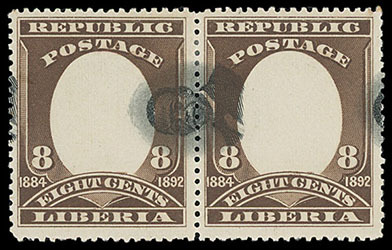 Liberia, 1892, 8¢ brown & black, center sideways, horizontal pair, without gum (as always), showing single vignette vertically split between stamps, rich colors, Very Fine. 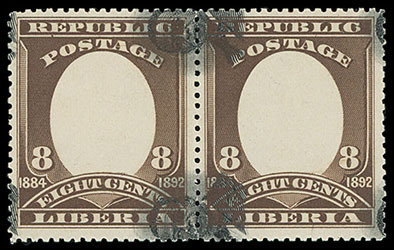 Liberia, 1892, 8¢ brown & black, center sideways, horizontal pair, without gum (as always), showing two vignettes vertically split between stamps, rich colors, Very Fine. 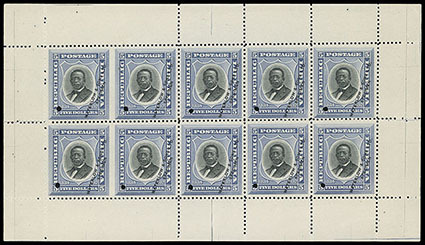 Liberia, 1892, $5 blue & black, trial color proof, complete sheets of 10, left horizontal pairs imperf between, each stamp with "Waterlow & Sons Ltd., Specimen" overprint and security punch hole, without gum, Very Fine, an extremely rare perf variety with only two sheets ever discovered, with 1988 note regarding the R. Lowe discovery, ex-Lockard. Scott No. 49TC Estimate $300 - 400. 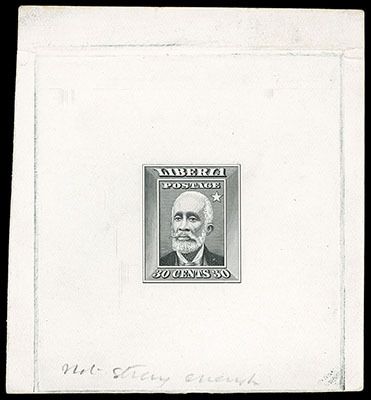 Liberia, 1909, 30¢ Barclay, progressive essay & die proofs, 5 items; includes essay in black on glazed card showing unfinished design with star at upper right of portrait, similar essay design in brown on wove, essay in black on glazed card with star removed and additional detail in forehead, finished design in black on glazed card and similar die proof in dark brown on wove, Very Fine, ex-Fosdyke Ray. Scott No. 122E, 122P Estimate $300 - 400. 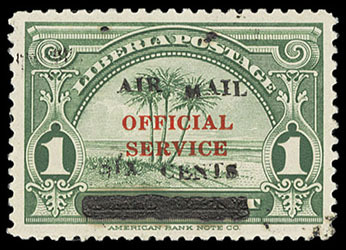 Liberia, 1936, 6¢ on 1¢-6¢ on 3¢ Airmail Issue Complete, full usual slightly dulled o.g., nicely centered throughout, bold colors, Very Fine, a choice set. 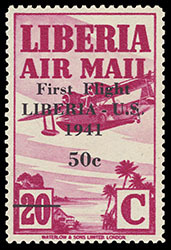 Liberia, 1941, 50¢ on 20¢ Magenta, First Flight Liberia - U.S., o.g., never hinged, fresh with deep intense color, Very Fine, an attractive and choice never hinged example of this great Liberian Airmail Rarity, with only five mint examples known to exist; signed Sanabria and others. Scott No. C23 $2,500 for hinged. 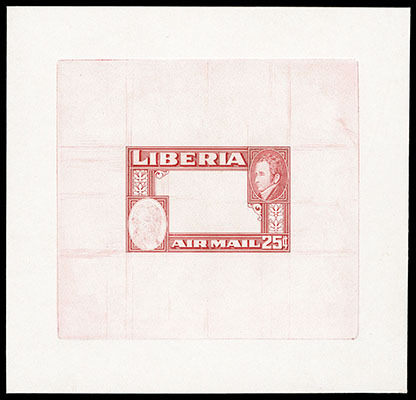 Liberia, 1952, 25¢ Map of Monrovia, large die proofs, 4 different die sunk on cards; includes frame only with incomplete Monroe portrait in carmine, frame only in grayish blue and deep red (later with bottom imprint) and complete design in red violet and black, Very Fine, a very scarce group. Scott No. C68P/TC Estimate $300 - 400. 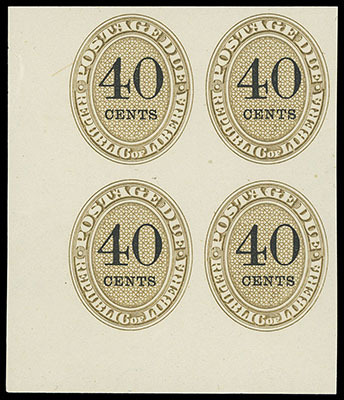 Liberia, 1893, 2¢-40¢ Postage Dues complete, imperforate, bottom left corner margin blocks of 4, o.g., never hinged, each with rich colors, fresh and pristine, Very Fine and choice, a very rare complete matching multiple set. Scott No. J3-J9 vars. Estimate $300 - 400. Liberia, 1901-02, 1¢ lilac rose Official, "Ordinary" handstamp (type I Buchanan handstamp), block of 10, neat 1902 Buchanan town cancels, nicely centered throughout, some light oxidization, Very Fine, quite certainly one of - if not the largest known multiple of the 1¢ Lilac Rose "Ordinary" issue, ex-Cockrill, Fosdyke Ray; signed Bloch. Scott No. unlisted Estimate $500 - 750.